This serum is based around an oil soluble form of Vitamin C called "Abscobyl Tetraisopalmitate" or VCIP. Most forms of Vitamin C are water soluble. Because the skin is protected by a layer of oil, this means that water soluble Vitamin C does not penetrate well. However our Vitamin C dissolves in oil and so can be absorbed deeper into the skin. VCIP at this concentration is especially good for pigmentation and sun damage. For this reason, we recommend it pigmentation around the eye area or other areas of the face where pigmentation is a problem. VCIP is a very expensive ingredient. We have done our best to keep this serum as affordable as possible. After comparing other serums with a similar amount of VCIP, we think you will be happy you found us. Directions: Before applying a moisturiser of your choice and before your makeup if you’re wearing some, gently massage or tap a small amount of Super Vitamin C Eye Serum on and around areas of pigmentation or sun damage. .Allow to soak in for as long as possible, but at least a few minutes, and then apply moisturiser if needed. Ascorbyl Tetraisopalmitate. ("Super" Vitamin C). One of our favourite ingredients and one of the most expensive anti-ageing ingredients available. Despite the expense, we have chosen to have one quarter of our Serum pure Ascorbyl Tetraisopalmitate because the evidence for its anti-ageing properties and anti-pigmentation properties are so strong. It is not average Vitamin C (Ascorbic Acid). This is a stabilized version of Vitamin C Anti-oxidant especially designed to penetrate the outer layers of skin down to where it is needed. What evidence is there? If you have a few moments we would love you to do some more research , please click here. for more information on this ingredient. There is no question that Vitamin E is an excellent anti-oxidant. However there are different forms of Vitamin E, and some are better than others for the skin. Synthetic Vitamin E is called dl-tocopherol. While this is good, Natural Vitamin E (d-mixed tocopeherol or d-alpha tocopherol) has twice the beneficial activity of synthetic Vitamin E.
Even better, we don't use just Alpha Tocopherol. We use a mixture of Alpha, Beta, Delta, and Gamma Tocopherols as there is growing evidence that that the skin benefits better from the different forms. 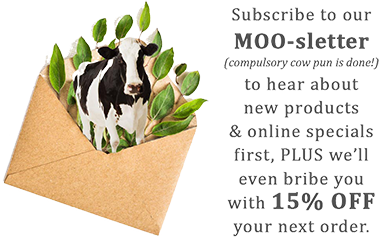 So although "Vitamin E" looks simple on the label, we put a lot of effort into choosing the correct forms of Vitamin E. By the way, MooGoo uses Natural Vitamin E in all our products. One quarter of our Eye Serum is pure and concentrated Natural Vitamin E.
One of the main components of human Sebum (that is our skin's oil) is called Squalene. It is a combination fat and anti-oxidant that helps keep our skin moist and protected against free radical damage. Sounds great. The problem is for most people, once we pass our early 20's our skin produces less of it. This leaves the skin more susceptible to signs of ageing. Thankfully, technology has meant that we can now make more Squalane through Olives, called Olive Squalane. We use Squalane in almost all our moisturising creams. In our Eye Serum, because this area needs very concentrated amounts, we concentrate it at 50% of the total formulation.